"The hat is too much, right?" 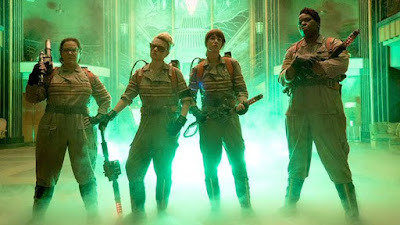 Sony Pictures has unleashed their first trailer for Ghostbusters, a new take on the beloved 80's franchise. Only this time around the cast is flipped with an all-female cast and a male receptionist. Of course I am extremely hesitant. #OhHollywood #RecyledMovies But who knows, this could end up being fairly decent. The new 2.0 cast stars the hilarious Kate McKinnon, Kristen Wiig (love), Melissa McCarthy (heart) and Leslie Jones, plus Chris Hemsworth (swoon). While I don't think it will hold a candle to the original, not by far, I do think this 'could' be fun. I will hold all my reservations/judgments until after I see it (ahem, mostly likely in the conform of my own home). Take a look! The upcoming Ghostbusters movie is directed by Paul Feig, from a screenplay by Katie Dippold and Paul Feig. Reportedly, the villain will be a "creepy mechanical genius." There's also the role of Martin Heiss, a professional debunker of the supernatural who tries to disprove the antics of the Ghostbusters after some videos of theirs go viral. The project is currently filming, with Paul Feig posting updates on Twitter - follow him @paulfeig. Sony Pictures will release this movie on July 22, 2016.